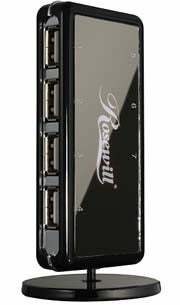 Why Can't I Run Multiple USB Devices? ImAWhat asked the Answer Line forum why, when he has two USB devices plugged into his "really cheap laptop," he can't run a third. The first thing you should do is make sure the ports are working. Unplug all of your USB devices, then pick a dependable one and try it out in each port. If it fails to work in one of them, the problem isn't the number of ports, but that particular one. should fix this problem (and makes a decent workaround for the single bad port problem, too). They cost about $30. Plug it into one of the PC's USB ports and into a wall power socket, and you'll have several new, separately-powered USB ports to play with. Another possibility: If your laptop is sufficiently old, it may have USB 1.1 ports, while your devices could be USB 2.0. That could cause a problem, but it's unlikely. USB 2.0 is backward compatible with 1.1; 2.01 devices run in a 1.1 port, just v-e-r-y s-l-o-w-l-y. My thanks to all the folks on the forum for contributing to this answer. You can read their suggestions at http://forums.pcworld.com/message/164488.